A modern bookmarks and tabs manager. 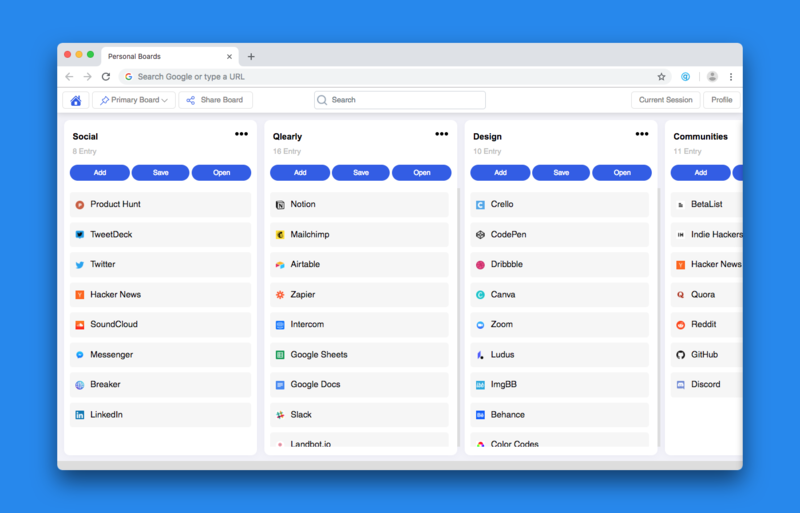 Qlearly is a modern bookmarks and tabs manager, here to help you organize your favorite websites by columns and boards. It can also be used to save certain links you want to get to later. To make it more convenient for you, every time you open a new tab, your primary board will load within a second. This makes it easy for you to access the information you need, when you need it. On top of that, we are building certain features such as shortcuts, search and many others. As of now, Qlearly is available on Google Chrome and Firefox. You can also install it on Opera and Brave. After installing the extension, a default board will open up. This is to make it easier for you to get started. To change your primary board, simply star a different one in the boards page. You are now ready to start setting up your primary board! 🛠 To help you get the most out of Qlearly, here is what some of the buttons do. If you are not sure about what of the buttons do, click on Command ⌘ + F to search through the list below. Add: By using this button, you can manually add bookmarks. Save: This will save all the tabs you currently have opened to this column. Open: This will open all the tabs saved in that column. Create Task: This allows you to add tasks to your board. Create Note: This allows you to add notes to your board. Delete column: This button will delete the entire column. Delete All Tabs: This button will remove all cards from the column. Import: This feature allows you to import a list or links. Share: By clicking this button, you will be able to create a public column. Home icon: The home icon will take you to your list of boards. List of boards: You can use this to quickly switch to a different board. 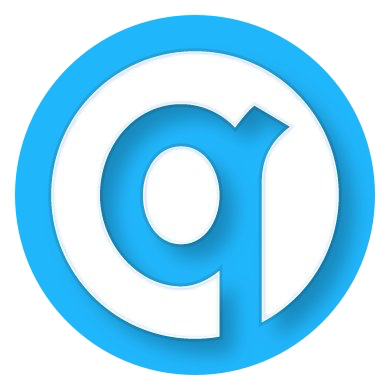 Share board: You can use this to share the board privately with another user or by creating a public link. Search: You can use the search field to search your boards, as well as searching google right from Qlearly. Bookmarks: This button shows a list of your browsers bookmarks. Learn more about this feature here. Current tabs: After clicking this button, you can drag and drop a single tab into your board. Profile: Use this dropdown to login, register. You can also use it to try our night mode and learn more about our shortcuts. Search field: You can use this search field to search all the tabs you have saved overtime and open the one you need in one click. Open Qlearly: This will open the 'boards' page. Save All: This will save all the tabs you currently have opened, to the column and board you selected above it. Save Current: This will save the tab you are currently on, to the column and board you selected above it. Open All: This button placed below the number of entries will open all the tabs from a specific column. You can learn more about specific features by visiting our help center. Here's an article on all the ways to save tabs on Qlearly. 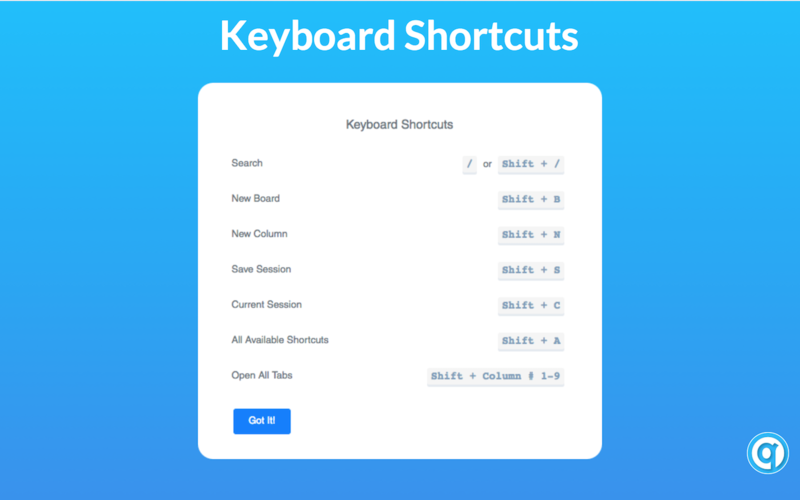 Finally, we also recommend getting familiar with our keyboard shortcuts. Thank you for taking the time to go over this article, I hope you will find our extension helpful!